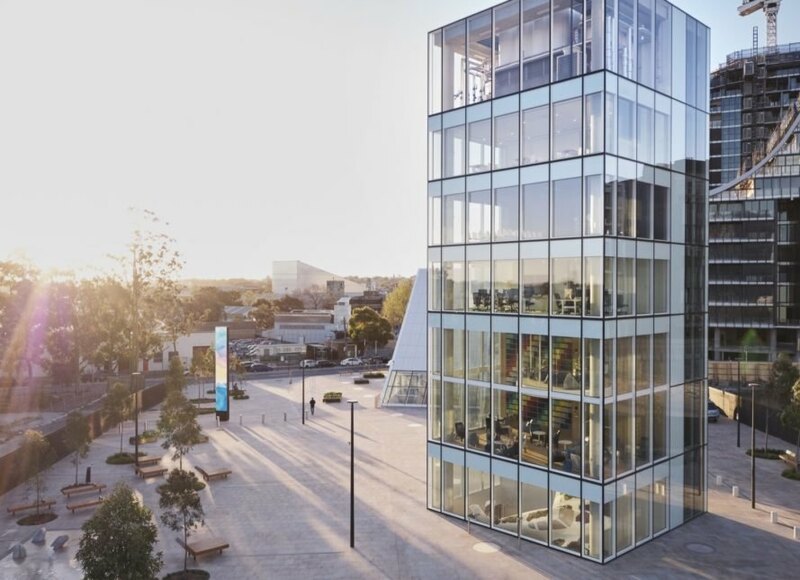 Former marshland in Sydney has been transformed into the new Green Square Library and Plaza, a striking project that’s not only revitalizing one of the city’s oldest industrial areas but is also a shining beacon for sustainability. 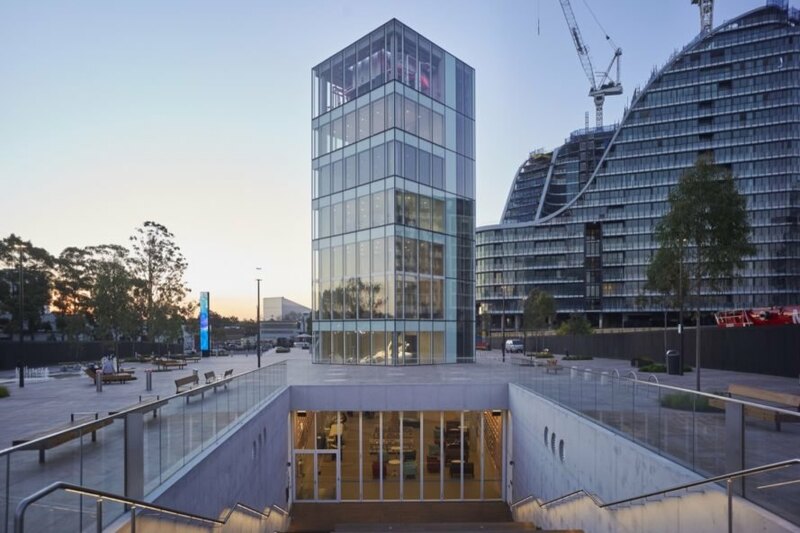 Designed by Sydney-based architecture and urban design practice Stewart Hollenstein in association with Stewart Architecture, the Green Square project features a semi-submerged underground library with a plaza on top. Energy efficiency drove the design as well, from the numerous skylights that let in natural light to the library’s low-energy displacement ventilation system engineered by Arup. Created as a central gathering space for the growing Green Square neighborhood, the Green Square Library and Plaza draws the eye with its playful geometric cutouts and pavilions that punctuate the 8,000-square-meter plaza. The triangular-shaped glass pavilion on one end marks the entrance to the 3,000-square-meter underground library, while the large circular opening next to it brings light into the circular sunken garden at the heart of the library. Also on the plaza is a six-story glazed rectangular volume that includes a double-height reading room, computer lab, black-box theater, music room and community space. An outdoor amphitheater is found on the other end of the plaza. 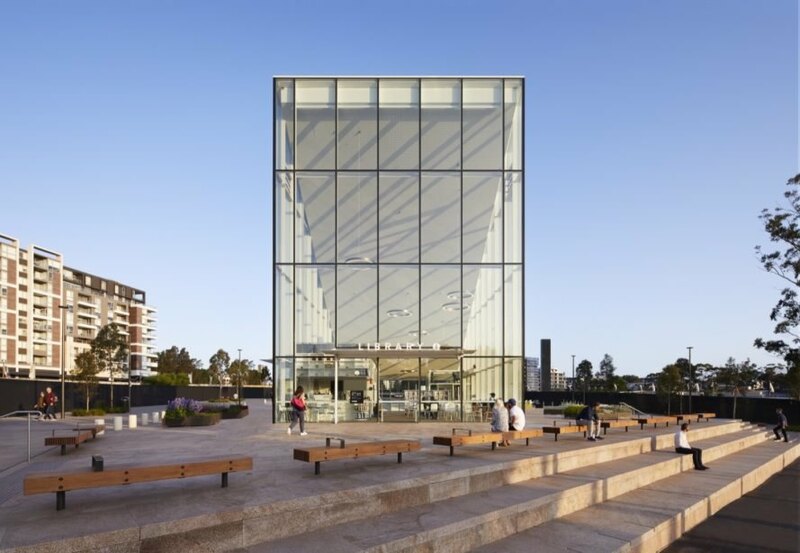 The four areas are visually connected with a series of 49 circular skylights that funnel light into the library, while the rest of the plaza is left open for other activities, from pop-up events on the lawn to a water play zone. 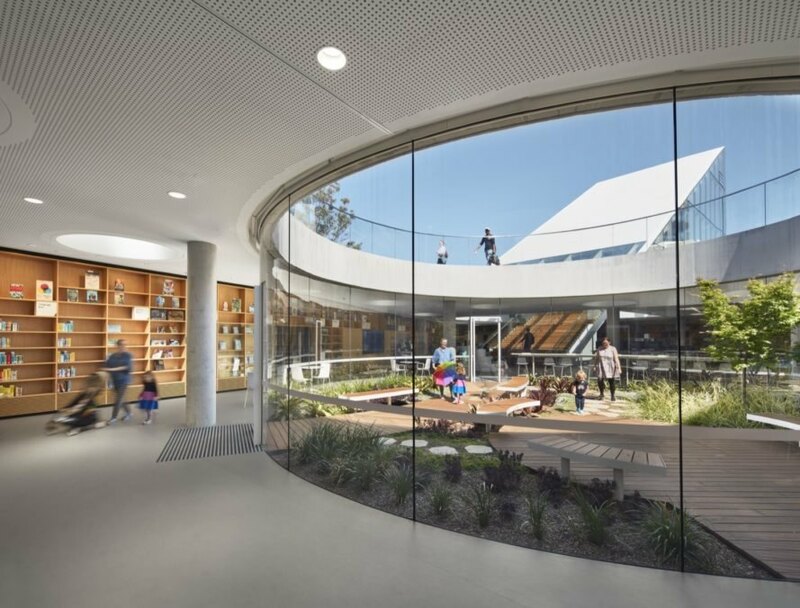 Underground, the open-plan library is centered on a sunken garden with a children’s circle and “story tree.” Placing the library underground was no easy feat; because the project sits on former marshland, the area came with a permanent water table above excavation level. Waterproofing with four layers of defense was crucial to protecting the library from damage. The feat of engineering allowed for ample green space above — a key detail that earned the design first place in the global design competition for the public library. 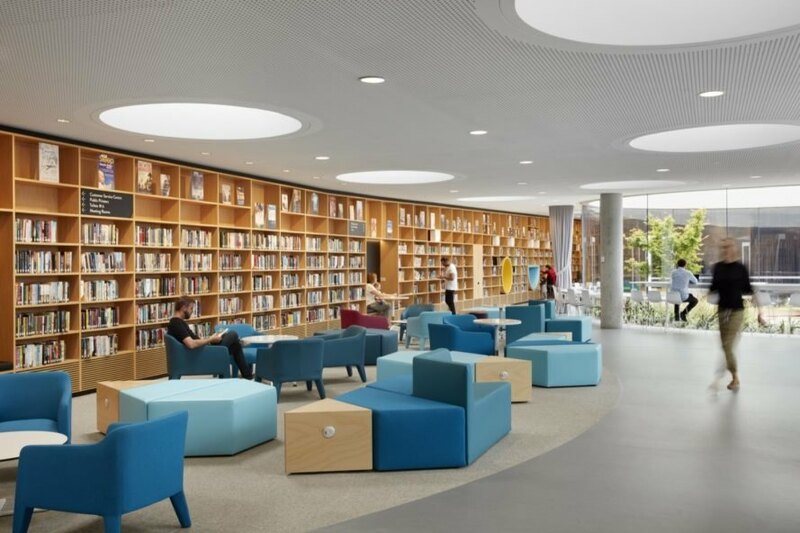 Daylight floods the library thanks to the weatherproof skylights that have been engineered to be walked on and to limit external heat gain. At night, the skylights are illuminated to bring visual interest and safety to the plaza. Reduced energy usage is also achieved with Arup’s bookshelf-integrated displacement ventilation system that brings improved indoor air quality and greater cooling efficiency. The landscaping on the plaza was designed to manage stormwater runoff and capture rainwater for reuse in the library. Stewart Hollenstein and Stewart Architecture collaborated on the Green Square Library and Plaza. 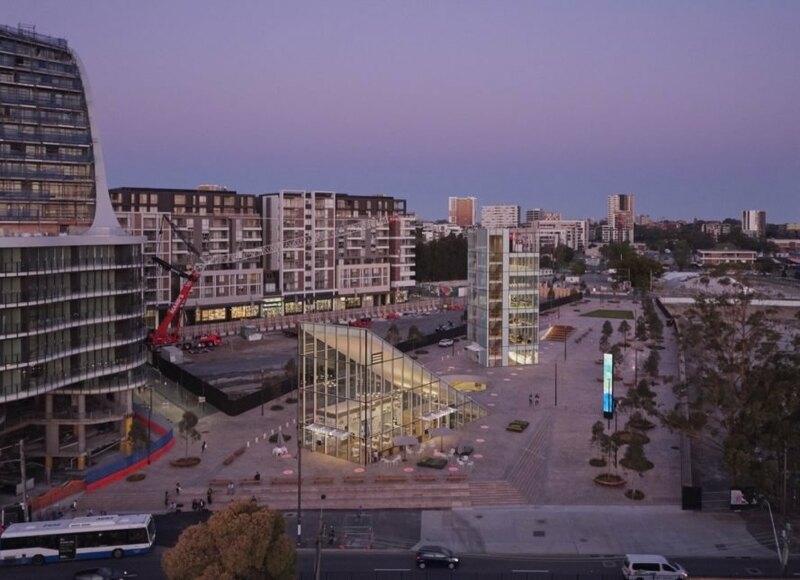 The imaginative design houses a library partially in a glass structure and partially underground. The abundance of glass allows natural light in all day long. The triangular building marks the entrance to the underground library. A peek inside the library. The library and plaza is a welcoming space for the community. Skylights let light filter deep into the library. 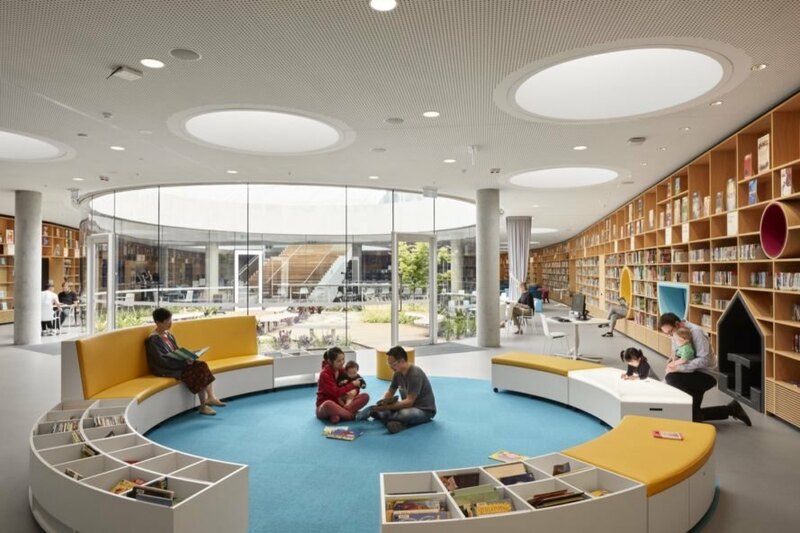 The open-plan library features a playful children's circle and story tree. The library is centered on a sunken garden. At night, the buildings truly stand out. Under darkness, the skylights emit the light from the library below, creating brightness for safety. In addition to being energy-efficient, the library and plaza manages stormwater runoff and captures rainwater.